Man…Oh…Man…..looks like it’s going to be a quiet month around here until the Halloween celebration on the 29th! In fact, I’m not sure I have enough material to work with to fill a whole column. I guess what is really happening is that everyone is taking a deep breath and preparing to get geared up for the all of the holiday 2017 festivities. I admit that I do love this place during the holidays and I get a little carried away so I guess I should just take a chill pill myself and relax before it all starts up. Speaking of “quiet”, I ran across a new addition to the harbor a week or so ago – we have our very own metallic mime! If any of you have experienced Jackson Square in New Orleans you know how interesting, or unnerving for some, these guys/gals can be. 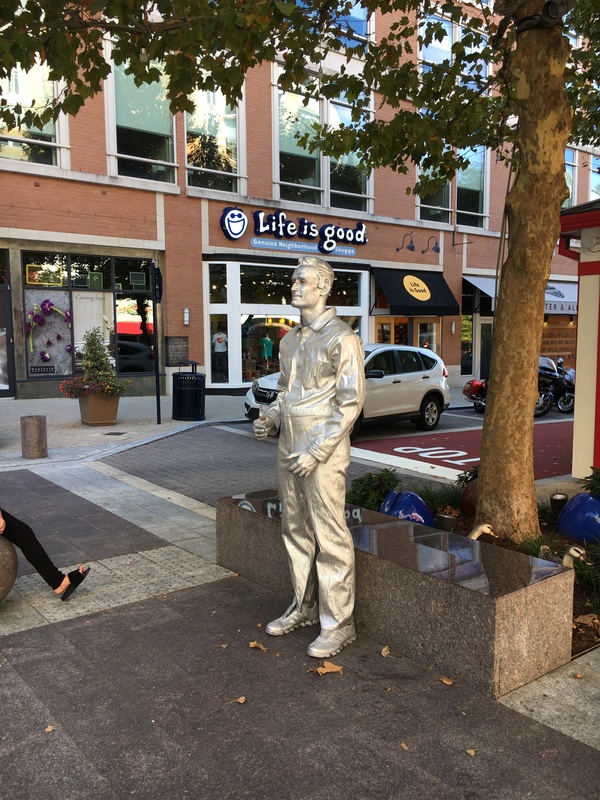 At any rate, joining the fabulous statuary that already adorns American Way was a “silver man” – not just his hair, his whole body – who was entertaining the Saturday crowd. As I watched, he really freaked out a group of kids who thought he was stationary just like the bronze of Dwight D. and likeness of Rosie the Riveter that are erected near each other and where he decided to stand. After posing with Ike and Rosie, they decided to pose with him for a photo-op and he decided to put his arms around them! Wish I had been taking a video. In fact, that is when I realized that he was a human and not just a new sculpture. In my never ending quest to find interesting people to write about for the OTC I decided to try to communicate with Silver Man in an attempt to get contact information from him. Well….he is a mime so…..between blinking once for “no” and twice for “yes” I did end up putting my contact information in his “silver” tip can but I have yet to hear from him. I might have been too scarey! That being said, I cannot tell you whether he intends to be a fixture at the Harbor this fall or not. I really hope he garnered enough in his tip can to make it worth his while since it just adds some more character to this fun place to live and play! Treat yourself to a quiet day at the Harbor this month and maybe you will spy the Silver Man playing tricks on the crowd!! (insert groan here) Have a Happy Halloween as well! !